Maybe you’ve tweaked your back while out in the yard, trying to do too much too quickly so you could catch the end of the Masters. Maybe you’ve pushed yourself a little too hard preparing for your next race and that ache in your knee won’t go away, even after a couple days off. Maybe you simply took a funny step off the curb and are feeling a little twinge in your ankle. Sometimes when you’re suffering from an ache, pain, or injury, you have a pretty good idea what you’re dealing with and you’re able to pinpoint the cause of it. That’s not always the case, but when it is, wouldn’t you rather get right to your physical therapist to begin treatment? Unfortunately, there are often a few hoops to jump through before you get started. The first stop is your primary care physician, who may then refer you to an orthopaedic specialist, who will write you a prescription for physical therapy. That process alone can set you back several weeks and a few insurance co-pays. In fact, a 2017 Merritt Hawkins study showed that the average wait time to see a physician is 24 days, up 30% from 2014. Wouldn’t it be great if you could cut out a few steps (and save a few dollars!) and head directly to your physical therapist? You can. It’s called direct access. WHAT EXACTLY IS DIRECT ACCESS? Direct access is regulated at the state level. Some form of direct access exists in every state, though the specific laws vary. Some states have no rules, while others have limits on the number of visits or the time period for which patients can seek physical therapy before a doctor’s prescription becomes necessary. At the very least, though, every state allows a patient to receive an evaluation without a referral. If you’re interest in learning more about Direct Access Laws, we recommend visiting the American Physical Therapy Association’s site. There are no restrictions or limitations to direct access in Kentucky. If the patient’s condition is beyond what the therapist can treat, the therapist must refer their patient to a physician or dentist. And when the patient does come with a referral, the therapist may communicate with the referring physician regarding the patient’s treatment. Treatment does not continue for more than 24 calendar days, beginning with the initial evaluation. The PT must then get a referral from the patient’s primary healthcare provider to continue. An order or referral from a physician, osteopath, or chiropractor is required for spinal manipulation. An order or referral from a physician, osteopath, or podiatrist is required for “sharp debridement.” The PT does not remove any foreign material from a wound using sharp medical instruments. SO SHOULD I TAKE ADVANTAGE OF IT, OR SHOULD I SEE MY PHYSICIAN FIRST? Our goal is to ensure that each of our patients receive the highest quality of care available, that they’re able to access that care quickly, and that it’s the care that’s right for them. Our patients are seen within two to three days of calling or filling out our schedule an appointment form, an upgrade from the average 24 days to see your primary care physician or orthopaedic surgeon. And of course, if your condition is beyond what we can treat, we’ll immediately refer you to the appropriate physician or specialist. WHY DOES DIRECT ACCESS REALLY MATTER TO ME? 1. Early access saves money! Over 50% in back pain costs alone. It also often prevents the need for further healthcare. Over 13 million Americans see their doctor each year for relief from chronic low back pain. The right physical therapy within 14 days of the onset of pain minimizes the average total cost of care by 50%. That’s a lot of money each year! Low back pain patients who receive physical therapy immediately after the pain begins and adhere to their treatment plan spend $3,000 a year in associated healthcare costs. Those who delay receiving physical therapy and do not adhere to their treatment plan spend $6,000 per year for all kinds of healthcare. At your first appointment with a physical therapist, you’ll receive a personalized treatment plan based on your evaluation and will begin implementing the plan that day. The primary care physician to orthopaedic specialist to physical therapist pathway is likely to put you well over the 40-day mark before you’re even in the door to see a PT. 2. Physical therapy is a CDC-recommended alternate treatment plan to dangerous opioids and in some cases, just as effective (if not more!) than surgery. It’s also a much cheaper alternative to costly diagnostic imaging. Physical therapists treat pain. Opioids mask it. “Side effects” of physical therapy include improved mobility, increased independence, decreased pain, and prevention of other health problems through movement and exercise. Opioid’s side effects include depression, overdose, addiction, and withdrawal symptoms. Physical therapy is effective for numerous conditions, and the CDC cited “high quality evidence” supporting exercise as part of physical therapist treatment for familiar conditions like low back pain, hip and knee osteoarthritis, and fibromyalgia. Opioid effectiveness for long-term pain management is inconclusive in many cases. Additionally, physical therapy has been found to be as effective as surgery for conditions including meniscal tears and knee osteoarthritis, and lumbar spinal stenosis. Plus, you don’t have to worry about side effects, risk of infection, etc. that are associated with surgery. 3. 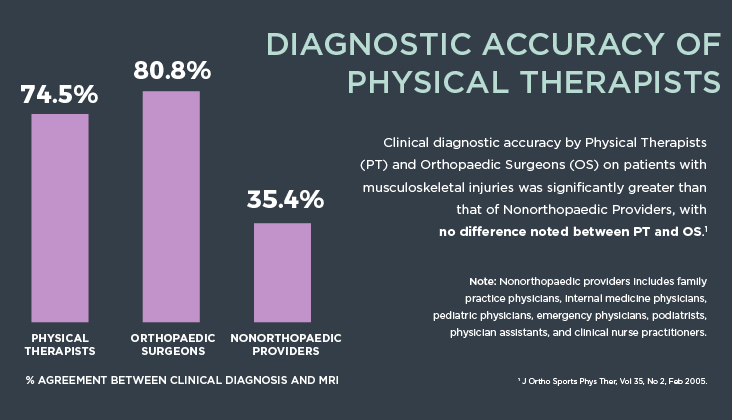 Your physical therapist and your orthopaedic surgeon are equal when it comes to diagnostic accuracy. 4. Direct access can lead to higher satisfaction and better outcomes for patients. It’s typically thought that patients are more likely to stick with a plan when it’s physician recommended, because they trust their doctor’s expertise. However, research shows that’s not the case. A 2014 study suggests that patients who received physical therapy through direct access (vs. physician referral) had a higher level of satisfaction and better outcomes at discharge. This study also highlighted decreased costs in the direct access group vs. the referral group, which can likely be attributed to decreased imaging, fewer visits, and less prescription medication. Sensing a theme yet? WHAT ABOUT MY INSURANCE, WILL IT COVER MY DIRECT ACCESS VISITS? Most insurances will reimburse for physical therapy services without a physician referral, although occasionally some do still require one. It depends on your insurance provider and coverage. Our billing team is more than happy to verify your benefits for you, feel free to give them a call at any time! Develop a Plan of Care: PTs must develop a plan of care for every Medicare patient. This plan should include a diagnosis, long-term treatment goals, and the type, quantity, duration, and frequency of visits. Certify It: A physician or nonphysician practitioner must certify that plan of care within 30 days of the initial therapy visit. When the certifying practitioner approves the plan of care, he or she must sign and date it. If treatment extends beyond 90 days, or if the patient’s condition evolves in such a way that the therapist must revise long-term goals, the plan must be recertified. The patient is NOT required to actually visit the certifying practitioner by law at any point in the process, though the practitioner may require it themselves. Note it on the Claim Form: Your physical therapist must list the name and NPI number of the certifying physician or nonphysician practitioner under the “referring provider” section of the claim form. Though it’s not necessarily relevant or required under direct access laws, it’s the current Medicare requirement. Whew. Am I right?! Let’s wrap it up with a little recap of the biggest benefits of direct access, or your right to directly access physical therapy services without a physician referral or prescription. Quicker access to the care you need. Our patients are seen within two to three days of scheduling an appointment, while it takes an average of 24 days to see your primary care physician or orthopaedic surgeon. Less associated costs and reduced need for additional healthcare services. The right physical therapy within 14 days of the onset of low back pain minimizes the average total episodic cost of care by 50%. 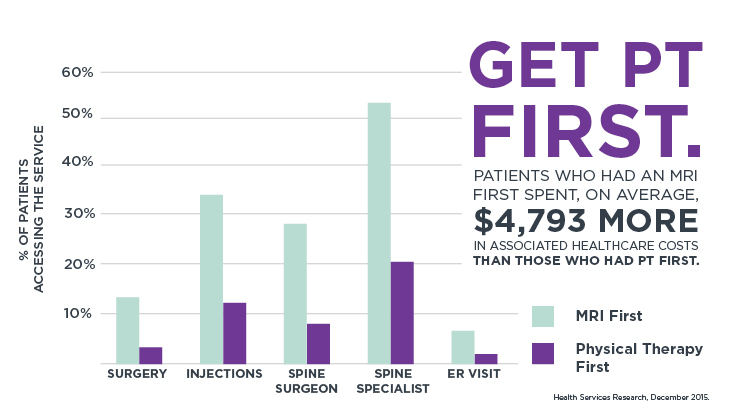 These costs are saved by avoiding surgery, imaging, and prescription medication. Better outcomes and higher satisfaction. Patients who received physical therapy through direct access (vs. physician referral) had a higher level of satisfaction with their care and better outcomes at discharge. At the end of the day, we’re by no means recommending you avoid your primary care physician altogether. But, in the instances when you know physical therapy is what you need, isn’t it better to get straight to the source right away? And this way, you’re ready to make an informed decision on the best choice for you. Ready to schedule an appointment? You can do so online! Want to learn more about our team? Check them out. Questions? Shoot us a note at [email protected].